When early Spanish settlers accidentally released wild horses (Equus cabalus) to the continent in the early 1500s, they returned an American original. Although the remnants of the escaped Spanish horse are protected by the 1971 Free-Roaming Wild Horse and Burro Act, each year thousands are removed from public lands across the American West to reduce competition between horses and domestic livestock. "El Caballo isn't a call to action. It doesn't tell anyone what to think, and it doesn't stake out a high ground or 'right' way to manage. What it does is present a little-known controversy, backed up with a diverse array of opinionated experts, and package it with eye-candy footage that never lets your eyelids sag." "Long considered an 'exotic' species, wild horses occupy a sort of borderland, caught between the mythology of their origins and the reality of their plight today. This is the subject of a new documentary, El Caballo, by Drury Gunn Carr and Doug Hawes-Davis. Known for their hard-hitting documentary films, Varmints and Killing Coyote, Carr and Hawes-Davis approach wild horses with a lighter, albeit no less powerful touch." 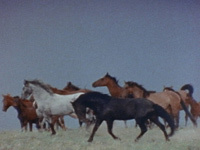 "An award-winning beautifully videotaped documentary...(T)he history of the horse in America that this film presents is quite valuable...Highly recommended for libraries whose patrons have an interest in American prehistory, history of the West, wildlife, and horses." "Simultaneously an engrossing exploration of the mysteries surrounding America's 'native vs. introduced' wild horses, as well as a blistering indictment of the BLM's pathetic land management policy." "A level-headed but powerful presentation... El Caballo provides a quick education on wild horses, with excellent footage and explanation of all aspects of the wild horse issue...El Caballo is timely and portrays an accurate picture of the torment these horses have endured, and still do, at the hands of man... El Caballo is a realistic call to action - A MUST SEE." The DVD contains both versions (54 mins and 30 mins) of the program.